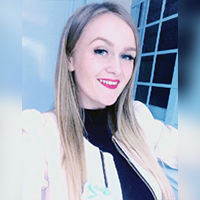 Testimonials | Ms. Dorina Loredana Ileni | Study Bridge Ltd.
Dorina is studying Business Management in Kensington College of Business. She contacted us and requested to help her with the Student Finance and also to help her to get enrolled into a Business Management course. “My ambition is to complete a degree at a UK college although there was always a fear not to reach the high level of English which was expected at degree level courses. This fear was wiped off when Study Bridge assured me that they would help me to reach that standard where I wanted to be.